Large new snow load of 3 feet in the Tamarack Peak area. On northerly aspects, this large new snow load was rapidly deposited on top of basal facets creating a deep slab avalanche problem. Signs of instability ranged from a reported deep slab avalanche in Hourglass Bowl (see separate avalanche observation) to numerous unstable snowpit test results collected by the SAC forecasters on other parts of Tamarack Peak. A deep slab avalanche problem exists in this part of the forecast area on N and NE aspects. The lower elevation limit of this avalanche problem is unclear due to a lack of available data but may be around 8,500' to 8,700'. NW aspect inclusion/exclusion in the deep slab problem is also unknown due to a lack of available data from NW aspects. 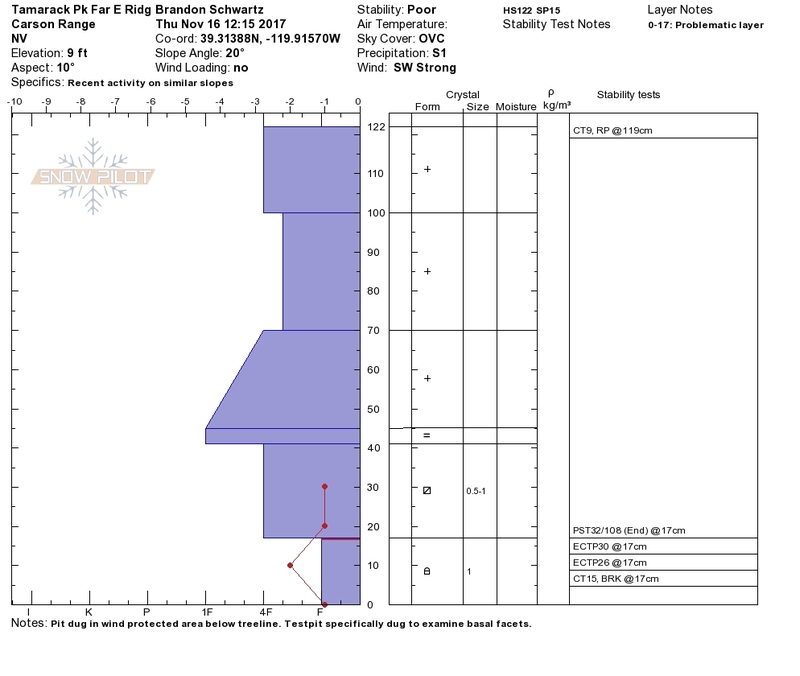 Snowpit data collected by forecasters today on N aspects at 9,480' and 9,870' indicated basal facet layers just over 1 foot thick with snowpit test failures occurring over the bottom 6 inches where the facets were most developed. Graphed snowpits are from near the summit of Tamarack Peak and from the Far East Ridge of Tamarack Peak. One localized collapse/whumpf was triggered while filling in the snowpit near the summit. Strong winds during this storm had also formed cornice along ridges above wind-loaded slopes. Ski kicks on a wind-loaded test slope did produce some small cracking that extended about 2 ft away from our ski tips. In sheltered areas, little evidence of problematic instability was observed within the storm snow. The main signs of instability observed today pointed to deep slab problems that are an issue because of weak old snow near the base of the snowpack and wind slabs that have formed during the storm. 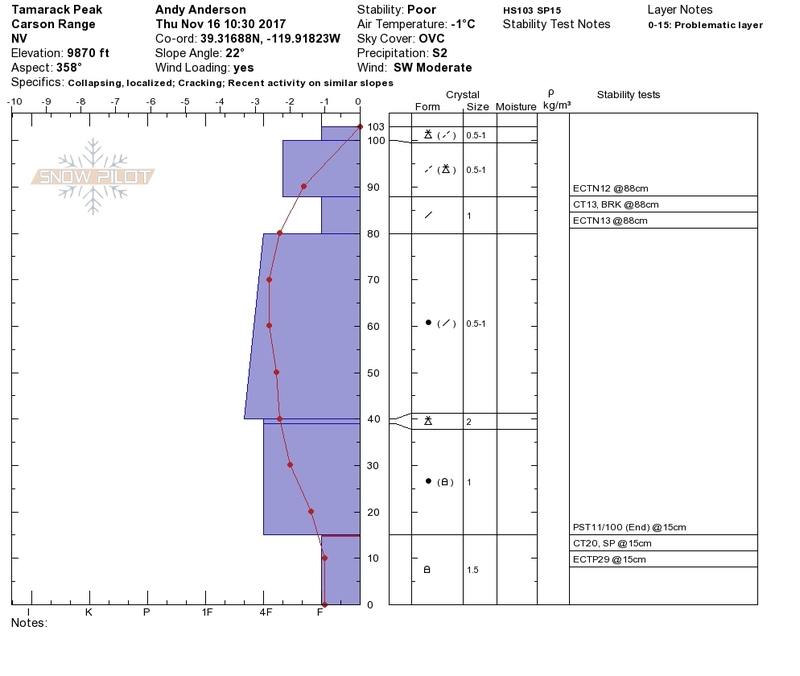 Video was taken at noted lat/long of snowpit on Far East Ridge and shows problematic snowpack structure with stubborn ECTP result. In the video the date is incorrectly stated as Nov 17. The correct date is Nov 16. Photo: Skier triggered cracking on a wind-loaded test slope on an E aspect at 9700 ft.
Skier triggered cracking on a wind-loaded test slope on an E aspect at 9700 ft.
Snowfall rate was generally s3 with lulls to s1. 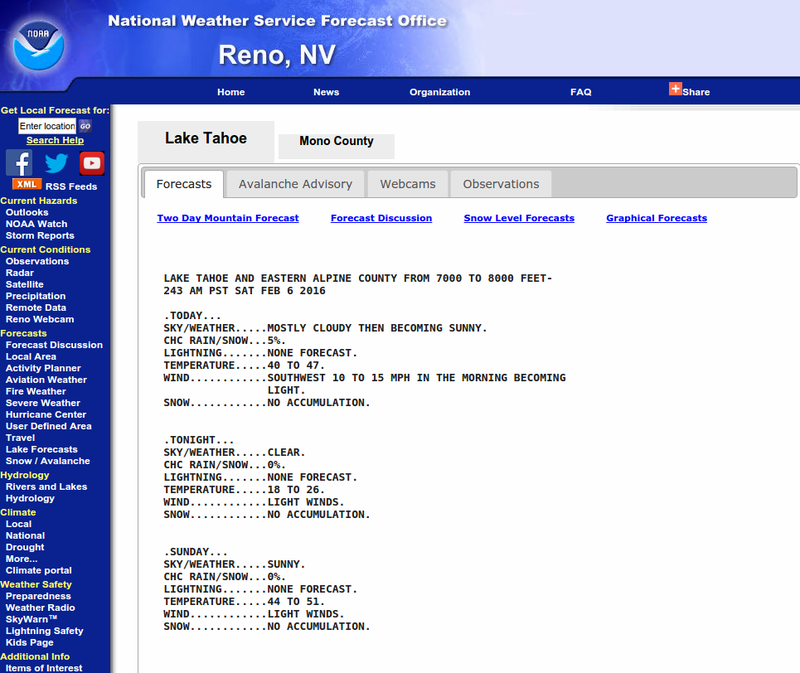 Snow level noted at about 8,200' in the morning and 7,600' in the afternoon.